This graph shows the run time of the four different processes making up a munin-master run. Munin-master is run from cron every 5 minutes and we want each of the programmes in munin-master to complete before the next instance starts. 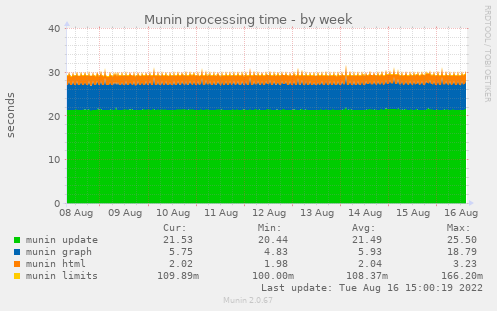 Especially munin-update and munin-graph are time consuming and their run time bears watching. 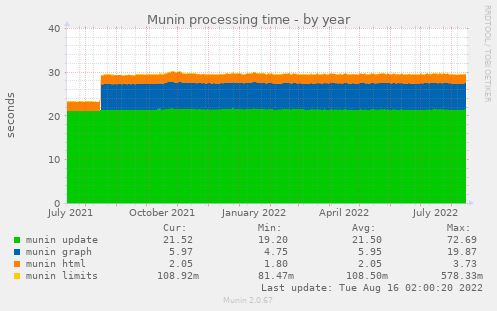 If munin-update uses too long time to run please see the munin-update graph to determine which host is slowing it down. 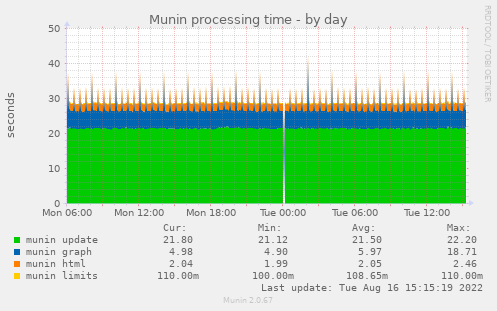 If munin-graph is running too slow you need to get clever (email the munin-users mailing list) unless you can buy a faster computer with better disks to run munin on. This page was generated by Munin version 2.0.33-1 at 2019-04-25 15:40:23+0200 (CEST).